As every sea kayaker knows, there are certain points on the tide tables that may require some attention, ie springs and neaps. I don’t know about you, but I tend to tense up a little at the mention of “springs” and relax at the word, “neaps” (whilst, being Scottish, trying not to think of turnip). We were due to go paddling in a quite tidal area, in the vicinity of the Firth of Lorne and Sound of Mull at springs, which is one thing. On this particular occasion, however, there was to be a much-reported “Supermoon”, the proximity and extraordinary gravitational pull of which, to my mind, would surely result in super tides … super-springy-spring tides! This did not escape the attention of my fellow paddlers, some of whom were declaring a desire to visit the springiest of tidal places, the Grey Dogs (and much evil laughter ensued). I decided to play it cool and see what transpired. As it turned out, level heads prevailed and we decided to proceed from Ganavan Bay to Duart Castle – a route that Alan and I had travelled before and enjoyed. We took note of the coincidence of timing of the 3 knot incoming tide with our return, but the consensus was that we would play it by ear. Setting out, conditions were flat calm, making for lots of special “Kodak moments” against the beautiful backdrop of Lismore, the Firth of Lorne and the Sound of Mull. 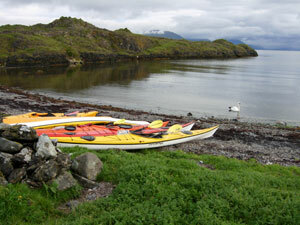 A prevalence of Tiderace kayaks was observed within our group, including a brand new Xcite out on its maiden voyage. It must be said that Tiderace are making big inroads in the sea kayak market and establishing themselves as a manufacturer of quality craft (I’ve not yet heard of anyone being disappointed in their purchase). With a nice little tidal push, we were soon over at Duart Castle. The castle is, of course, highly photogenic and nothing sets it off better than a kayaker paddling in front of it (the same could be said for most things). We landed for a picnic lunch and, suitably fortified, were soon back on the water to face up to the aforementioned 3 knot tide on our return to the mainland. And so, we paddled vigorously, taking a transit of a small house on the opposite shore. After a while, it was certainly evident that, despite all the effort, progress was a little slow. One of our group offered up encouragement by declaring that we would soon be seeing the windows of the small house, and so we paddled on. More time passed and, not only could I not see the windows, I was having trouble seeing the house! To my intense disappointment, the house appeared to be getting smaller. I had been deliberately avoiding turning my head to look at our departure point and, in then doing so, disappointment turned to disgust as I realised that the Mull shore was, in fact, getting closer. We were literally going nowhere quite speedily. You will note that I am employing the “royal we” in the above narrative. I cannot make a broad statement concerning the capabilities of our group. I’m pretty sure that certain members may well have had sufficient power reserves to have turned on the turbo boosters and left the tide trailing in their wake (so to speak). Alan and I, however, were not averse to admitting that we hadn’t consumed enough Wheaties/spinach/banned substances and that a return to Mull for a wee rest and some contemplation would be the most prudent course of action. Upon our rapid approach to the shore, I found myself experiencing one of those surreal tidal head-games, when points on the shore are moving at high speed, while the paddlers in front of you are stationary. Once in the eddy, we paddled west until we found a landing spot where we stopped for some further refuelling. Fortunately, tidal rates descend by sizeable chunks with time and, after about 40 minutes, we knew that the flow would be at a reduced speed sufficient to afford us some decent progress. The sea state had long since forgotten its mirror-like calm and was now quite lively, the wind having risen from the north. Fortunately, this gave us a push in the right direction. Even so, it required an energetic effort to cross the Firth and, after some time, Alan confessed to having hit a wall, metaphorically speaking. Somehow, digging deep (and in the knowledge that he hadn’t packed a tent), he bravely soldiered on. This was, however, a valuable lesson in the need to pack some extra rehydrating fluids and energy bars for those unexpected moments of depletion. It’s something we would never fail to do when cycling, hillwalking or running, due to the very evident intensity and dehydrational impact of those activities. You don’t necessarily have the immediate feedback of gushing sweat and bursting lungs with kayaking, unless you’re racing or survival paddling. The average paddling excursion tends to be a slower burn, requiring more stamina and strength (especially upper body) than supreme cardio fitness. Regardless, and especially over time, resources still need to be replaced efficiently. Our trip had been an interesting test of our Northern Light Greenland and Aleutian paddles and I was very pleased with the outcome. I didn’t encounter any elbow or wrist aches that I’m pretty sure would have accompanied a Euro paddle on such a trip, and correspondingly, I didn’t have to worry about feather angle in the wind. Ganavan Bay was a welcome sight as we eventually returned to its shores. It could be said that we fought the tide, and the tide won, but I prefer to think of it as conceding a small battle, only to win the war. A visit to the “sugar boat” (the MV Captayannis) in the Clyde off Helensburgh. I recall the night it was wrecked, and it was all the talk of my primary school the next day. The ship itself dates back to the 1940s (it was wrecked somewhat later, I hasten to add) and is now the home (or at least perch) of sea birds and other marine critters, for whom it provides a “fragrant” environment. Being able to view an historic and personally meaningful shipwreck above water is quite a unique opportunity and beats having to don a diving suit! A pleasant paddle in the Kyles of Bute culminating in our attendance at the Colintraive Fete immediately upon our emergence off the water. As we trailed our soggy presence through the crowds and stalls, many strange looks were cast our way. Apparently, wetsuits and cags are not de rigueur at a country fete. It was a relief to stumble upon a friendly and welcoming face – that of Andy, the chief burger flipper who, when he is not flipping venison burgers, is a fellow paddler. A return journey across the Clyde in order to accompany swimmers participating in the cross-Clyde charity swim which was being supported, as per tradition, by the RWSABC. Each swimmer was appointed a kayaker to guide them across the river, and it was up to the kayaker to assess the best (and fastest) “line”. This introduced a slightly more competitive element to the kayaking proceedings than I had anticipated and the responsibility weighed heavily upon me, for a few seconds at least. I soon realised that the presence of slack water and the allocation of a fast swimmer reduced any need for strategic tidal planning on my part and my role reverted comfortably to that of security blanket, so to speak. Hats off to the swimmers that day for their sterling efforts which were quite inspiring (must get back to the pool and work on swimming fitness!). Rolling practice is of course ongoing, mostly occurring along the shores of the Clyde or in Loch Eck. My on-side has been tested in a variety of kayaks now and is still “on” (hooray), while my offside has progressed from DOA to sporadically AWOL, with occasional bouts of FUBAR. A windy weekend spent surfing (and a bit of slogging) on Loch Fyne, interspersed with refuelling stops in civilised tea/lunch establishments at Castle Lachlan and Inveraray. These outings were marked with some poignancy, being that Julia was about to go under the knife that Monday to have her knee ligaments reorganised. At least she managed to squeeze the very last droplet of saltwater out of the weekend. A quiet and peaceful outing to Loch Caolisport. Whenever I mention this loch to anyone, I am greeted with a quizzical look – which might explain why we had the place entirely to ourselves (apart from one prawn fishing boat, some seals and seabirds). With beautiful views of Jura and Islay and a lovely lunch beach, it has a lot to offer. Perhaps I shouldn’t have said that. A day spent paddling around the north end of Lismore. This brought to mind our first ever kayaking trip of any significance, which took place at that location. It’s pleasing to reflect on how those first tentative paddlestrokes have led to something that’s now approaching a way of life. This is a scenically awesome area, and under 2 hours’ drive away from where we live. The wind reached F5 on our return journey to the Benderloch vicinity, resulting in quite an effort. “Rotation” was the order of the day, as I worked to engage my very toe muscles in assisting my rapidly tiring arms and shoulders in the battle against the wind. It was, however, definitely worth it. As always, the many kayaking opportunities presented to us have been thanks to the availability of an ever-expanding array of amiable paddling companions whose company we have much appreciated. Not least of these of course is Julia who is now off the water momentarily whilst mending from her knee surgery. Hopefully, it won’t be long before we see her return – better, stronger, faster than she was before! We wish her a full and speedy recovery. But in the end it’s right. I hope we have the time of our lives. At a time in life when it feels like some of the pleasures (I won’t say follies) of youth are catching up and restricting you, it is all the more exhilarating to pick up a new activity. Just when things are shutting down, like hillwalking due to bum knees (Alan), running due to gammy hip (me), something opens up and makes you feel like you’re 20 again – mentally at least. It’s like setting back the mileometer on life a little.